Rose Zarelli, self-proclaimed word geek and angry girl, has some confessions to make 1. I’m livid all the time. Why? My dad died. My mom barely talks. My brother abandoned us. I think I’m allowed to be irate, don’t you? 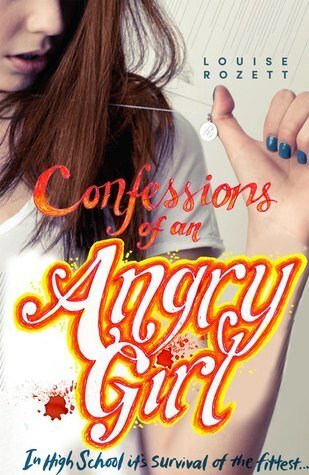 I received Confessions of an Angry Girl to review from Netgalley and didn’t start reading it immediately, deciding to put it away for a while whilst I got through a few more books. I finally started reading this as I wanted a good contemporary read and this looked very promising. First of all, I would like to say that I loved our main character, Rose. She reminded me of myself in a weird way and I enjoyed reading about her mainly for this reason. I’m not a huge geek, and neither was Rose, although, like me, she worked hard and tried to get good grades. From the cover, title and blurb we get this image of an incredibly angry girl who was been through troubling times. Yes, she has been through hard times but she really isn’t very angry. I think the anger is more grief than anything and her feeling that she couldn’t do anything to save her father. It’s despair, really. Jamie Forta! How amazing is that name?! He was this slightly bad boy with a past just as bad as Rose’s and they really were the perfect match! He already had a girlfriend, though, which added a few complications. He really was quite a typical YA love interest, but it really didn’t bother me this time. I was actually pretty comfortable with it. The other characters were really great as well and they were all rounded and whole, rather than flopping all over the place. I was annoyed in all the right places, and squealing in places at times too! The plot idea is really good and a little like Mean Girls, but totally unique! We have the bad girl (who is also called Regina! Coincidence?) and the super hot male: what else do we need? It was written really well and I loved the addition of dictionary definitions at the start of each chapter. I think that Rozett has managed to portray a perfect high school setting and created believable and compelling characters. I’ve been wanting to read this book! I like how you said that you loved the main character, because loving the characters can really determine whether I enjoy a book or not. I like the fact the the bad girl is named Regina. Lol! I like the premises of this story, and I’m very curious to know why Rose is an angry girl. I’ll definitely check it out. Thanks!